APPLETON — Fitbit users in Appleton are the highest steppers in the country, averaging 8,208 a day, according to the company’s recent rankings. Green Bay took the second slot. Fitbit makes the popular wristwatch style step counter and health tracker. The company released its annual results May 15, 2017. Overall, Appleton ranked as the second most-fit city in the country. The Midwest did well overall. 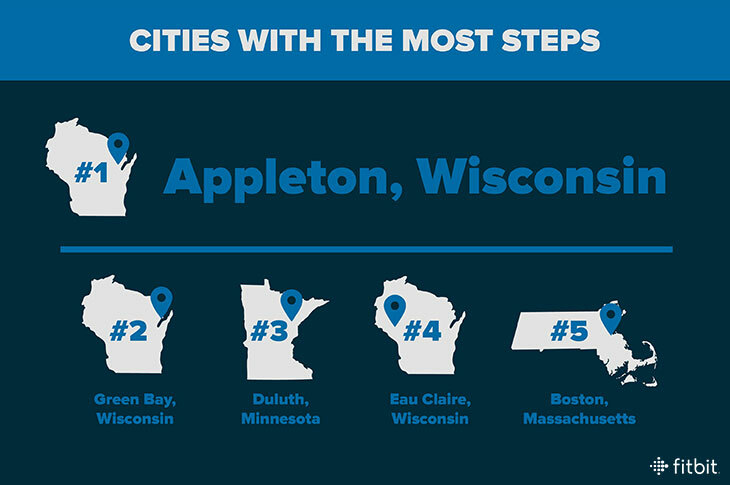 Minnesota put two cities in the top 10 (with Duluth taking this year’s top spot), while Wisconsin represented with three cities in the top 10 (Appleton, Eau Claire, and last-year’s winner, Madison, which fell to sixth place). Fitbit users in Eau Claire slept the most, with an average duration of 7 hours, 6 minutes and 43 seconds per night. Rounding out the top 10 were 6) Billings, Montana, 7) Boulder, Colorado, 8) Athens, Georgia, 9) Madison, Wisconsin and 10) Boise, Idaho. Two cities in Minnesota also made the top 10: Duluth, No. 3, and Rochester, No. 8.